Jack Towarnicky cited survey data showing the disparity in fees paid by smaller plans vs. larger plans. Sponsors of small and midsize plans may be paying too much in fees, particularly if they're being charged a percentage of total plan assets, according to industry experts. In 2017, participants in a defined contribution plan with fewer than 1,000 participants paid a median 0.6% of assets in total fees, while those with more than 15,000 paid only 0.4%, according to a survey by NEPC LLC, a Boston-based investment consulting firm. "Every survey you see, I don't care who does it, confirms the same thing," said Jack Towarnicky, the Columbus, Ohio-based executive director of the Plan Sponsor Council of America. Fees charged to plans with fewer participants and smaller average balances are higher both in dollar amount and percentage of assets than in larger plans, he said. 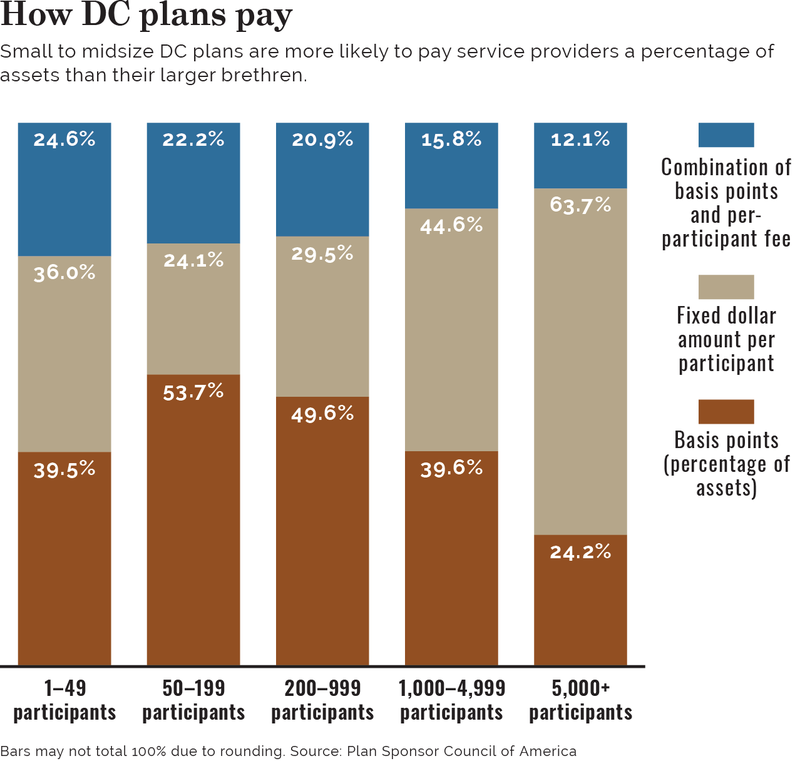 The disparity can be attributed to both the plan sponsors themselves and the record keepers. Sponsors of small and midsize plans often don't have the time or knowledge to benchmark fees. Meanwhile, record keepers have pursued their own self-interest, pushing smaller plans into asset-based fee models, which may hurt participants long term, industry observers say. expensive as the plans grow. Over the past 10 to 12 years, large plan sponsors have negotiated fixed-dollar fees with their vendors, while smaller plans have tended to pay fees using basis points on assets, Mr. Towarnicky said. Almost 2 in 3 plans with fewer than 50 employees paid either a percentage of assets (39.5%) or a combination of an asset-based and a per-participant fee (24.6%), according to PSCA's 2018 61st annual survey of 598 profit-sharing and 401(k) plans. That's "exactly the opposite" of large employers with more than 5,000 employees, where 63.7% paid a fixed-dollar amount based on the number of participants, Mr. Towarnicky said. Leslie Smith, a partner and national DC plan consulting practice leader for Aon PLC in Somerset, N.J., agreed that fixed fees are more prevalent among larger plans. "We're seeing fees move toward a per-participant fee model but a lot of (plans) in the small market are still (charged) asset-based fees," she said. Ms. Smith said the larger plans initiated the shift away from asset-based fees about 10 years ago, but that it's now moving slowly "down market" to the smaller plans. "It takes time," she said. Ascensus LLC, a record keeper that primarily serves small and midsize plans, for example, moved to fixed fee-based pricing in 2005. "Our fees are predicated entirely on the number of people in the plan," said Jason Crane, the Deerfield, Ill.-based head of retirement sales at Ascensus. "It's very easily understood exactly what it is we charge for and exactly what we're charging." The record keeper had nearly 58,000 plan sponsor clients with less than 1,000 employees and oversaw $67.8 billion in assets as of Sept. 30, according to Pensions & Investments data. Mr. Crane said that because none of the firm's fees are asset-based, its "revenue doesn't grow as the plan grows or at least as the plan assets grow in the absence of growth of the underlying employee population." "We think that's where the market is very much heading. We've been there for a decade-plus," he said. Asset-based pricing, of course, can work to a sponsor's benefit. At times it can be less expensive than what a record keeper might be willing to quote in a per-participant fee model, said Aon's Ms. Smith. The problem is, "there will come a point where plans might be overpaying based on the growth of their assets and the new calculation of the fees," she said. Three Bell Capital, a registered investment adviser that serves venture capital firms and other small employers in Northern California, has worked with plan sponsor clients to shift between 40% and 50% of plans that were asset-based to a fixed per-participant fee or a mix of asset- and fixed fee-based pricing since 2016, said Andre Huaman, a partner with the firm in Los Altos, Calif. Mr. Huaman could not determine the level of fee reductions that resulted from the changes but said that it was reasonable for sponsors of healthy small plans to expect double-digit percentage decreases in pricing every two to three years. Oystein Konsmo, the Tucson, Ariz.-based chief financial officer of independent mortgage bank Nova Financial & Investment Corp. opted for asset-based pricing with a cap about three years ago. The cap put a limit on fees, an arrangement that made sense for the bank's $22 million plan, Mr. Konsmo said. While Mr. Konsmo declined to disclose the amount of the cap or the basis points charged on assets, he noted that the plan hit the cap quickly due to the plan's rapid growth. The plan doubled its assets in the past three to four years due to implementing auto-enrollment and auto-escalation plan features that led to a participation rate of more than 90%. Given the plan's robust growth, the company does benchmarking every quarter to make sure fees are reasonable because "they can easily eat into earnings," he said. Mr. Konsmo echoed a widely held industry mantra. "It's extremely important for the plan sponsors and the fiduciaries of the plans to be benchmarking the fees on a regular basis," said Aon's Ms. Smith. Ms. Smith recommends that plan sponsors benchmark their plans at least once every three years and then do a full RFP once every five to six years. For asset-based plans, she recommends doing fee benchmarking more frequently because "if they grow very large, the fees could get out of line very quickly." "In the small and midsized market, there's a lot of wiggle room in pricing," said Three Bell's Mr. Huaman. If a $20 million plan becomes a $25 million plan in 12 months, Mr. Huaman says he will tell the record keeper that if it wants to keep the business, it "will need to come down a little bit." "If you're prudent as an adviser and you have good relationships with the record keepers and the providers, you could ask every year, 'we want you to relook at pricing in this plan,'" Mr. Huaman said. "If I can get my clients reduced 10% every two to three years on a $15 million plan, that's good," he said.